Enhance your understanding of language and culture. You’ll find the course offerings in the Department of Romance Studies both intellectually exciting and extremely useful. The breadth of our course offerings will give you the range of knowledge and perspectives you need to grasp the nuances and complexities of a variety of cultures in an increasingly globalized world. Designed to teach you to express yourself clearly and effectively in French, the program in French and Francophone Studies also acquaints you with the depth and breadth of literary and cultural expression in French. Promoting not only communication skills, Hispanic Studies encourages you to explore cultural contexts and texts to lead to a broad understanding of issues facing Hispanic communities. An interdisciplinary minor, Italian Studies enables those who wish to extend their study beyond language to areas of Italian literature, history, film, art history and music. You may also petition for an Independent Major to further expand your Italian studies. The Department of Romance Studies would like to express its support for the recent calls for diversity as it does for all efforts to achieve diversity in racial, linguistic, cultural, economic and sexual terms. We as a department are committed to being part of any effort toward this goal. We will strive to do this every day in our hiring practices, in the issues we teach and in the way we relate to the students. 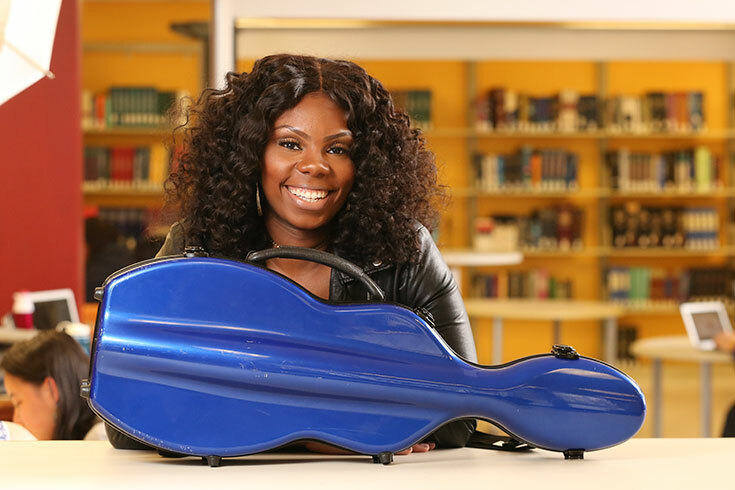 While studying the sciences, DeBerry maintained her mastery of the violin via Brandeis’ performing arts programs and also managed to learn Italian, which enabled her to study abroad in Siena.